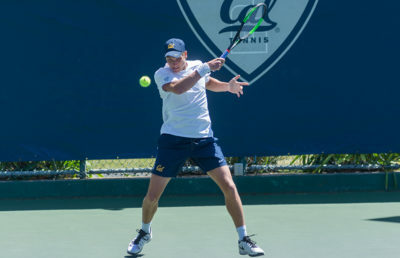 Following ten combined seasons with the Cal men’s tennis team, the collegiate tennis careers of seniors Andre Goransson, Florian Lakat and Filip Bergevi have finally come to an end. 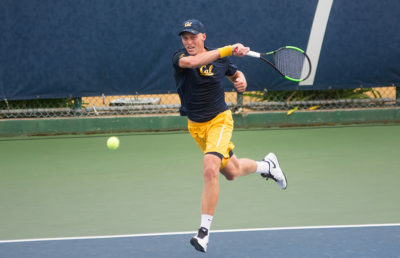 Goransson and Lakat participated in the singles tournament while Lakat and Bergevi teamed up for the doubles tournament, but all three fell short of a championship bid in their final chapter with the Bears. In singles play, No. 61 Goransson and No. 12 Lakat each defeated a Carolina representative in to advance to the round of 32. Goransson bested No. 71 junior Harrison O’Keefe from the University of South Carolina with relative ease, winning the first and second sets by a score 6-2. The senior trailed 1-2 when thunder intervened and put the first set on hold for approximately 45 minutes before play could resume. Upon returning to the court, Goransson scored five unanswered points en route to securing the first set. The senior handled business in the second set to advance to the round of 32. Following Goransson’s win against O’Keefe, Lakat took to the court and defeated No. 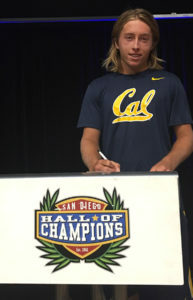 22 freshman Ronnie Schneider in a singles rematch from Cal and UNC’s head-to-head earlier in the week during the team round of 16. The senior avenged his loss, beating the freshman 6-4, 6-3 to advance. Play was once again suspended midway through the first set, this time due to rain. Lakat was ahead 3-2 at the time of the stoppage, but found himself down 4-3 following the resumption of play. Lakat battled back from the deficit to beat Schneider in the first set and knock him out in the second set. The round of 32 presented Goransson with an opportunity to seek some revenge of his own as he matched up with No. 16 freshman William Blumberg of UNC, who eliminated the senior during team play. Blumberg would only need two sets in the latest matchup and eliminated Goransson from the tournament with 7-5, 6-2 victories in sets one and two. Lakat continued to carry the torch for the Bears and advanced to the round of 16 with a win over No. 48 Texas A&M sophomore Jordi Arconada 6-4, 6-3, setting up a matchup with a familiar foe in No. 11 junior Tom Fawcett of Stanford. 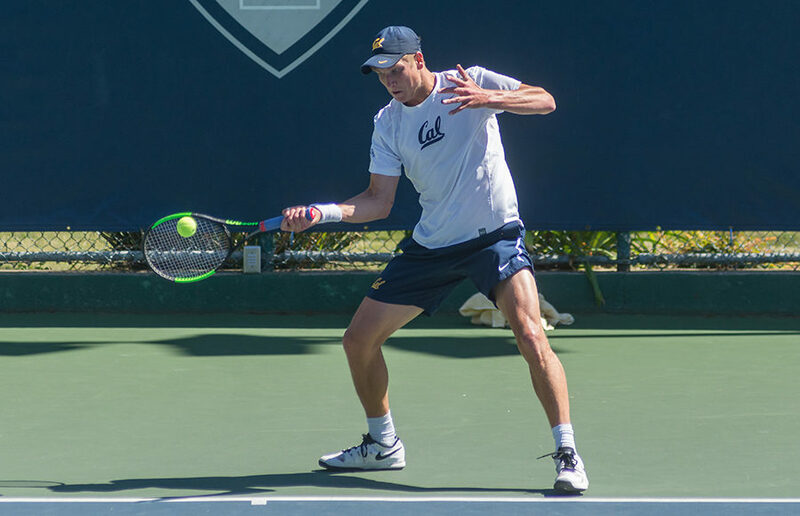 Lakat and Fawcett entered their head-to-head with a bit of history; in a 4-3 Stanford victory over Cal in March, Fawcett defeated Lakat in both doubles and singles. Lakat couldn’t erase his early season demons and Fawcett eliminated the senior 7-5, 7-5 in two gritty sets. The senior may have been eliminated in singles, but still had the opportunity to claim a title in doubles alongside Bergevi. The No. 5 duo defeated the No. 22 pair of redshirt sophomore Will Little and sophomore Juan Benitez 6-2, 6-4 in the round of 32 to the round of 16 for a matchup with the No. 22 Baylor duo of sophomore Reese Stalder and senior Jerry Lopez. Both pairs battled tough in the third set, but Stalder and Lopez came out on top to eliminate Lakat and Bergevi, ending both their season and careers as Bears. All three seniors will depart the team with a plethora of accolades having led the charge for one of the nation’s tennis powerhouses in their respective tenures.